For any product, a version 1.0 release must promise innovation in order to fill a gap or resolve a pain that nobody has addressed yet, otherwise, there is no justification to develop the product. This is what JFrog Mission Control did when it was first released. Mission Control 1.x started out by making it easy for Artifactory administrators to setup, manage and monitor their Artifactory services giving them a clear picture of their global binary artifact workflow. A version 2.0 release must also show innovation to keep those early adopters engaged, giving them new ways to use the product. But version 2.0 also has a greater responsibility, one of maturity, stability and forward thinking gained from the experience of all those 1.x versions. 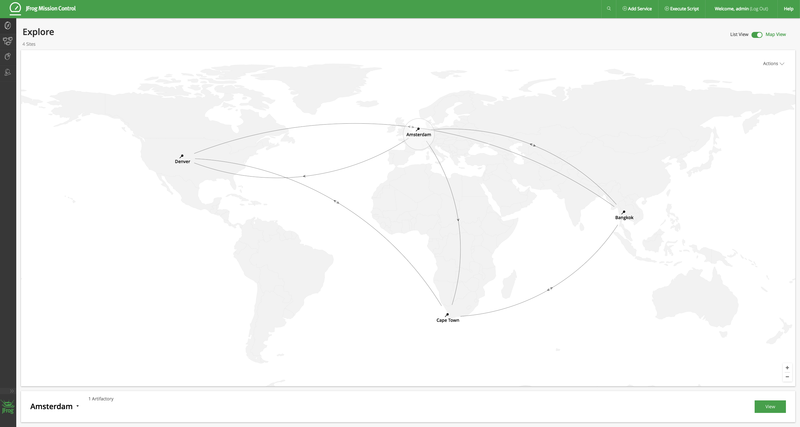 This is what the recent release of JFrog Mission Control 2.0 brings to JFrog enterprise customers. While it has a familiar look to it, Mission Control 2.0 has undergone vast changes from version 1.x, both on-screen and under-the-hood. Managing global teams is a challenge. As an enterprise enters new markets in different parts of the world, you may need to set up new datacenters in different locales. In version 1.x, a configuration script performed a single action. This meant that you had to run many small scripts to fully set up a datacenter. The new scripting in Mission Control 2.0 has removed this restriction making your life much easier by allowing you to perform any number of actions on any number of services in a single script, using your favorite IDE and version control tool. The new and improved scripting flow makes it very easy to create, edit and run scripts. Clear tabs take you through the steps of scripting, and the dry run clearly shows the impact that the script you are about to run will have on its target services and repositories. Mission Control 2.0 provides several enhancements that will help you scale up smoothly as your business grows. The Graphs UI has been improved to give you better visibility on how the Artifactory services under your control and their repositories are using their storage, making it easier for you to identify and mitigate impending bottlenecks. And the database supporting these graphs has been changed to Elasticsearch which makes it easier to extend data for analysis and provides far broader analytical capability for future improvements. Then, as you grow, your Artifactory servers will become more and more critical to the smooth operation of your business. You will want to take advantage of Mission Control’s Disaster Recovery. And let’s not forget the need to avoid security vulnerabilities in the binaries stored in your repositories. This is where Mission Control 2.0 support for Xray steps in. You can now manage JFrog Xray from Mission Control, connecting it to Artifactory services, and setting up watches to alert you of any suspicious artifacts that have been downloaded to your Artifactory repositories. The third pillar of this release aims to provide you a clear picture of your global setup and how it will be affected by the scripts you apply. Mission Control 2.0 has undergone a visual transformation. While it still looks familiar, the UI has been massaged to be fully consistent with the Artifactory and Xray look and feel giving you a coherent user experience as you move between these three products. The various Artifactory and Xray services you manage are not arbitrarily dispersed around the globe. They are usually focused the different datacenters you set up to serve the physical sites where you have set up offices. That is why the Mission Control “Site” was created. By aggregating all your services into Sites, you can quickly and easily see how your global teams are connected, both at the level of Sites, and then, by drilling down, at the level of individual services. This hierarchical organization of your Artifactory and Xray services gives you a clear view of your global artifact workflow at any level. We’ve done everything to make it easy for you to install or upgrade to Mission Control 2.0. There are clear and easy installation and upgrade instructions. We give you best practices for migrating your scripts to the new 2.0 paradigm. There’s really nothing to hold you back. As always, it’s free to use with Enterprise Artifactory and Xray services. Not using Artifactory yet? No problem. You can get started with an Enterprise Free Trial.